I am torn on the career of Ang Lee. On the one hand, he’s made some pretty amazing films. The Ice Storm, Crouching Tiger, Hidden Dragon, and Brokeback Mountain are astounding and it is no surprise he won multiple Oscars for his work – two for Best Director and one for Best Foreign Language Film. On the other hand, Hulk and Billy Lynn’s Long Halftime Walk were pretty dreadful – hell, Hulk was so lackluster is nearly killed off superhero movies all on its own. Somewhere in there he added the interesting failures Ride With The Devil and Taking Woodstock. Where I’m torn is this: I can’t tell if Lee is truly a great director, merely a good one who got it right a couple times, or one who just got really lucky a couple times? Yes, good and great directors make failures all the time without bothering to take the risks Lee did, so I’m not stressing over that. After all, Billy Lynn was shot at an ultra-high frame rate, meaning Lee could not really perfect the performances and tone of the film without crippling the budget. Plus, an ultra-high frame rate changes everything you do about the film, right down to the makeup. So it’s failure can partially be chalked up to the limitations of the medium he was working in. As a technical exercise, it works. As a narrative, it’s a flop. With respect a Hulk movie? Well, Lee is not exactly a no-brainer for that sort of property, and good filmmakers flounder with superhero movies all the time. Still, you can’t fault him for trying. The problem for Lee is that a good director will usually elevate the material, and too often in his career, he has not. Where the material is solid, he is solid. Where the material is a bit suspect, so is he. Truth is I appreciate a filmmaker doing different things and variety has been the single auterist streak running through Lee’s work – I defy you to find another filmmaker other than Spielberg who’s worked in as many different genres as Ang Lee. At the same time it must be accepted that all the genre hopping can mask a fundamental shortcoming in the director’s toolbox as much as it can reveal brilliance. Perhaps if he had a certain house-style he brought to his projects, a la David Fincher or Stanley Kubrick, that would settle the question. Alas, he does not. The reality for Ang Lee is probably this – we’ll never really know if he’s a great director or a lucky one, simply by virtue of him having such varied interests. And given the descriptions of the next two projects on tap for him don’t fit into any of the molds he’s already struck – Gemini Man, a sci-fi film with Will Smith, appears to be in late stages of filming as of this writing, while a 3D take on the Ali-Frazier fight, called Thrilla In Manilla, with a script by Peter Morgan seems on deck – we may never know. In the late-70’s a religiously-inquisitive Indian boy, Pi, lives at a zoo owned by his parents. For reasons of historical significance to India, but which are otherwise baffling to me without further research, the family decides to emigrate to Canada. The plan is to sell the zoo animals on arrival and use that to finance their new life. Unfortunately, some few days out from India the boat they’re travelling on sinks, leaving the boy, and a tiger, the lone survivors on a lifeboat, with little food or water, to survive nearly 300 days adrift. 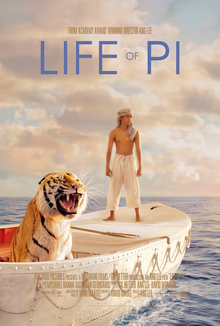 The Life of Pi is constructed as a story told by the middle-aged version of Pi (Irfan Khan) – he’s living in Canada now, so we know he survives – to a visiting writer (Rafe Spall). The story? The younger version of Pi (Suraj Sharma) surviving the ocean voyage. The writer’s intent? Write a book about the event. In this way, the elder version of Pi serves as a framing device, and narrator, for the movie. Except, instead of acting as a typical framing device, giving us nothing more than a way into the film at the beginning, and a way out at the end, while disappearing for the mid-sections, this device is all-encompassing, dipping in and out of the story fairly regularly, just to remind us of how the story is being told. But the dipping in and out is not in service of showing us some special actions by the middle-aged Pi. Or how his life has fundamentally changed in practice. No, it is merely to pull the viewer away from the interesting parts of the film to see middle-aged Pi sitting in one easy chair reflecting on the story, while the writer sits in another chair, looking on in disbelief. Lots of staring into the middle-distance occurs. Why are we pulled out of the story in such an inelegant way? Just to underline every point the film tries to make, as if we need underlining. The truth is that for about 40 minutes in the late-mid section, when the narration/voiceover disappears, the film is at it’s best. At that point it feels pure. When it returned, I groaned. Looking back, the lack of narration for that portion of the movie makes me yearn for a version of this film where the narration/voice-over is abandoned altogether. I can only imagine how much more magical, and honest, the film would be were it not burdened with 15 minutes of a middle-aged man soberly setting up the story, then soberly telling us about the time he almost died on a lifeboat. We don’t need to be told how it was when we clearly saw it for ourselves. If we’re honest, though, nobody really came here for the story of The Life of Pi – they came for the visuals. They came to see an Indian boy survive on a lifeboat with a tiger, in the middle of the Pacific. In order to achieve this, the film uses a mixture of real and visual effects, which means while the boy, the water, and the boat were real, everything else was fake. Including the animals. But though the animals are fake, they are so convincing they seem to occupy the same space as Pi – it was only the rarest of times when I had the feeling I was watching a rendered tiger rather than a real one, and then, it was probably because I was on the lookout for it and couldn’t help but wonder at the absolute precision of every single move the tiger made. But it wasn’t merely the animals that were created with VFX, because most everything you see was as well – like I said, the water and the boat and the boy were the only consistently real elements. And those that were real were certainly sweetened by VFX. Effectively sweetened. Which is the best way you can use VFX , to improve the reality you already have in a seamless way. Over and over again the movie gave us some new composition that just stunned – there iridescence in the water, the stars at night, the tiger and the boy simply existing together. This was done with VFX and in the end, when the film won an Oscar for the effects it was deserved. If there was anywhere the VFX failed it was in the transitional elements and in the action-based sequences. With respect to the transitions, because most everything in the center of the film was created, that meant the film did not have to make transitions in the usual way, with hard cuts from place to place. Jarring cuts. Rather, the film could visually remove or add elements from one place to the next, allowing the film to sort of dissolve in a strange way from here to there without the film actually dissolving. Even so, this was not nearly as smooth as it could be, with the various elements appearing to have been clearly worked on, bearing the tell-tale line around the elements present in old-school green screen work. Worse, though, was the VFX during the action scenes, particularly during the sinking of the ship, and when the boat seems to be attacked by a whale. Because these elements were all created – they did not work with an actual whale, or sink and actual ship – the objects in the film don’t operate with the same grip on physics that real-life objects would, robbing much of the film of it’s weight. No, it’s not terrible, but if I’m meant to gasp and think, “Oh my god, this is dangerous!” then what I’m looking at must appear legitimate. Otherwise, I just shrug indifferently at the danger all those pixels and polygons face. Afterwards, I did a small bit of research on the film and I think the problem with the terrible bits of VFX is while the film was meant to be viewed in 3D, I watched it at home in 2D, which flatted various elements. Of course, this is not my failing, it’s the film’s failing. After all, films usually find their widest audience in home-viewing, or in 2D presentations, and so if the movie is not at least readjusted to accommodate that in it’s various formats, it shall reap the criticism it sows. 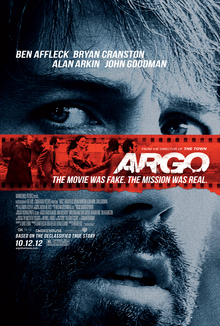 Best Picture 2012 was Argo and if we’re honest, it benefited from Ben Affleck being screwed out of Best Director nomination. While Argo was still probably favored overall on it’s own merits, the screw-job on Affleck surely put it over the top in the Best Picture race. To be clear, this does not take away from the film, which is really quite stirring and proves that, aside from the reception of his follow-up, Live By Night, Affleck has directing talent. But even if sympathy for Affleck might’ve edged Argo over the finish line, it is a superior film to The Life of Pi. Far superior. If I had my druthers, though, neither would win Best Picture – I’d give the award to Silver Linings Playbook. Yes, the film feels a bit pat at times, and simplified, but there’s also a lot of truth and urgency the others lack. Plus, it’s a film that feels like it’s about real people just trying to get by. And even though it can be simple at times, it doesn’t really present any easy cures to mental health. Realistically, though, Silver Linings Playbook succeeds because it was the first one that proved Bradley Cooper really could act, introduced us to Jennifer Lawrence as a force, and reminded us that Robert DeNiro was still capable of giving a good performance. If that’s worth anything, it’s worth Best Picture. In the history of the Oscars 20 men have won Best Director at least two times. The most wins in the category are for John Ford – 4 times – and Frank Capra and William Wyler, with three. All three of Wyler’s wins corresponded with a Best Picture win, two of Capra’s wins corresponded with winning the big one,  while just one of Ford’s also won the big one. Of the 17 other men to win Best Director twice, all but three had at least one of their Oscar wins correspond with a Best Picture win. The unlucky three? I haven’t seen Sense and Sensibility in many years so will remain mum on it here, am mostly ignorant of his early films, and missed Lust, Caution. Given how prolific Spielberg is, it’s safe to say in his career he’s literally done a little bit of everything. I’m hardly optimistic about any Will Smith film these days, while the 3D elements of Thrilla in Manilla have me worried. He’s Hindu, Christian, and Muslim. The ultimate point of this film is that there is a God, of some sort or another, and that people need interconnection to survive. In it’s way, this movie is probably as religious as any later-day Kirk Cameron movie, except it’s far less heavy-handed and better made. Ironically, the religious film standard bearer of the millennium is The Passion of the Christ, which is more a well-made snuff movie than religious movie. Generally I say movies are too long – that’s almost always my first reaction – but in general I only suggest trimming here and there to get the run time down. Well, with The Life of Pi I don’t think it needs trimming, it needs to lose one huge, unnecessary, element of the film altogether. It’s crazy to think that almost half of the total Oscars given for Best Director were given to just 20 men. It’s like knowing that almost 29 of 52 Super Bowls in the NFL were won by just six teams. Mrs. Miniver (1942); The Best Years of Our Lives (1946); and Ben-Hur (1959). It Happened One Night (1934); and You Can’t Take It With You (1938). His outlier was Mr. Deeds Goes To Town (1936). How Green Was My Valley (1941). His outliers were The Informer (1935), The Grapes of Wrath (1940), and The Quiet Man (1953). Lewis Milestone, Best Director (1929/30) for All Quiet On The Western Front is not often considered to have won two Oscars for Best Director, best one of them was Best Comedy Direction for Two Arabian Knights at the 1st Oscars in (1927/28). That particular award was discontinued after that year and is likely why it’s never really mentioned.